Particular functional features of the slats (width, spacing, orientation, and location) are essential to optimize the effectiveness of a wooden doormat. The Vermont Wooden Doormat's slats are 3/4" wide with 3/4" spacing, oriented at a 45 degree angle (like the teeth on a hand file), and located above the surface on which the doormat sets. These features best enable all types of media (dirt, beach sand, mud, water and snow) to be effectively scraped (plowed) off of shoes and boots and pass down through the slats. No other wooden doormat offers all of these features. Only sustainably harvested eastern white pine, a long-lasting, resinous wood, and galvanized nails are used. Wood is carefully selected and cut to ensure that each piece fits precisely and the doormat is flat and uniform. Galvanized nails (over 100 in total) are driven into each contact surface from the bottom and sides, not from the top. All outside corners and edges are lightly sanded. This handcrafted process results in a wooden doormat with furniture-like quality. A 2 1/2" x 8" brush with a 1 1/4" palmyra bristles recessed as shown in the photographs is offered as an option. Barn Red, Mountain Green and Slate Gray Stain on top (scraping) surface of slats are the optional colors available. 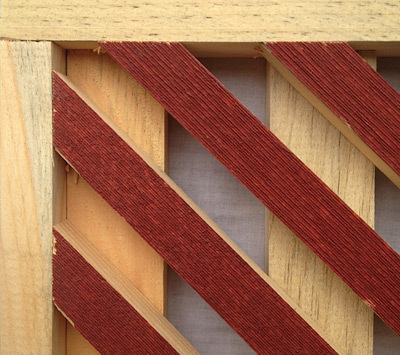 Top surface of slats has a special surface finish so that the stain penetrates deep into the wood. "Natural" doormats have no sealer or stain.